Accomplished alumni regularly return to campus to offer career advice and insight about life after college. Last month, art major Brett Banning (C’11) shared his path to his current employment with Uber as a product designer (also known as user experience, or UX, design). During workshops and presentations, Banning brought a “real-life, boots on the ground” view of working for a high-tech company in San Francisco. In 2017, Banning was hired as a designer on Uber’s Global Vehicle Solutions team, where he helped develop a program for onboarding new drivers. His knack for working through tough problems caught the attention of Uber management, who recently promoted him to lead designer on a six-person UX team that’s launching the Uber Bike app, which is currently being tested in San Francisco and Washington, DC. 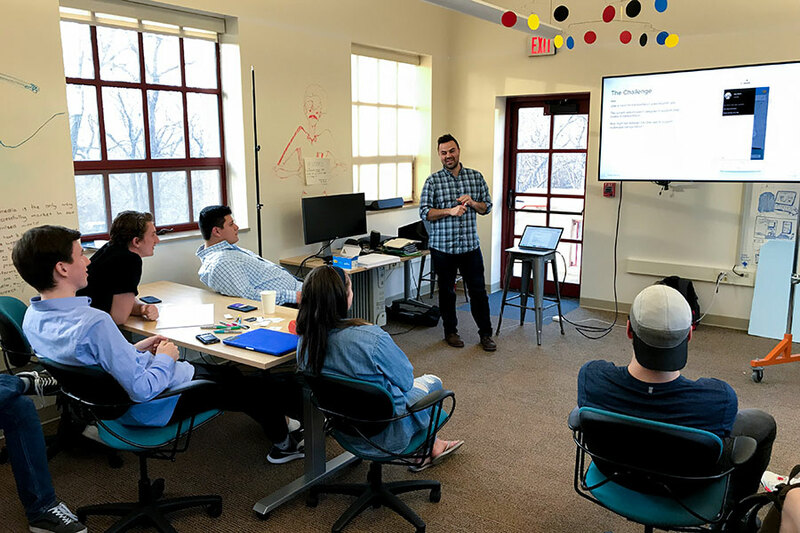 During a workshop session in Principia’s Center for Entrepreneurship and Innovation, Banning led a timed exercise giving students an opportunity to try out the human-centered design methodology he uses to develop literally hundreds of possible solutions before a product is ultimately launched. He shared insight into the technology (without giving away proprietary knowledge), citing an ever-evolving mix of wireframing, prototyping, and design tools. Before joining Uber, Banning worked in Principia's Marketing Department, at Caleres, and at Monsanto. While at Monsanto, the work he posted on Dribbble, an open source website for designers to showcase their projects, caught the eye of his current manager and led to his being hired at Uber. He also told students about his experience on a team of designers that won the 2016 GlobalHack VI Grand Prize and the First Place Pro Division prize for their app to help alleviate chronic homelessness.